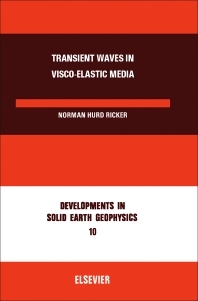 Developments in Solid Earth Geophysics 10: Transient Waves in Visco-Elastic Media deals with the propagation of transient elastic disturbances in visco-elastic media. More specifically, it explores the visco-elastic behavior of a medium, whether gaseous, liquid, or solid, for very-small-amplitude disturbances. This volume provides a historical overview of the theory of the propagation of elastic waves in solid bodies, along with seismic prospecting and the nature of seismograms. It also discusses the seismic experiments, the behavior of waves propagated in accordance with the Stokes wave equation, and wavelet functions and their polynomials. The book explains the laws of propagation of seismic wavelets and seismic ray paths, as well as the equations of wavelet propagation, the velocity-type seismic wavelet, and the spectrum of the wavelet. It discusses the motion of a mechanical seismograph disturbed by extraneous forces or motions. It also provides information on the differential equation describing the motion of a galvanometer, laboratory studies of wavelet contraction, and characteristics of a wavelet-contractor amplifier. Furthermore, the book explains the experimental studies of the primary seismic disturbance and internal friction. This monograph is a valuable source of information for physicists, students who want to pursue a career in geophysics or selenophysics, and those who actively working in these fields.